Raspberry Ketone, the carefully selected ingredients in Sumabe® Raspberry Ketone Coffee for Slimmers have nutritional benefits to assist in healthy weight management and overall wellbeing. 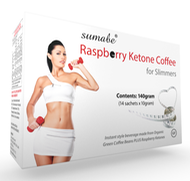 Sumabe® Raspberry Ketone Coffee for Slimmers is an instant style coffee that can supplement your current weight management routine. Simply replace your morning coffee with Sumabe® Raspberry Ketone Coffee for Slimmers, it’s that simple! How does Raspberry Ketone work: So how does a simple fruit extract aid in such amazing weight loss results? There are two primary reasons. Raspberry Ketone increases the brain chemical norepinephrine. Norepinephrine breaks down the fat inside of fat cells. The second reason is that Raspberry Ketones increase the secretion of Adiponectin. Adiponectin is a protein, created by fat cells, which helps break down fat, regulate sugar levels and regulate metabolism. High levels are found in thin people, while low levels are found in the obese. By increasing the amounts of this protein in your body, you can decrease fat and increase your metabolic rate.